Cherubfish (Centropyge argi) were raised from captive-spawned eggs at 77-79F on wild copepods and artemia. First record of Cherubfish culture. The Cherubfish is common in the aquarium trade. The species is found in Florida, the Bahamas and throughout the Caribbean on reefs, rubble zones and mud/sand bottoms from 15 to 200 feet. It is most abundant at depths below 90 feet and more commonly occurs in the southern part of its distribution. Adults grow to 3” in size. The Cherubfish is a popular aquarium fish due to its captive hardiness, small size, attractive deep blue metallic color and affordability. 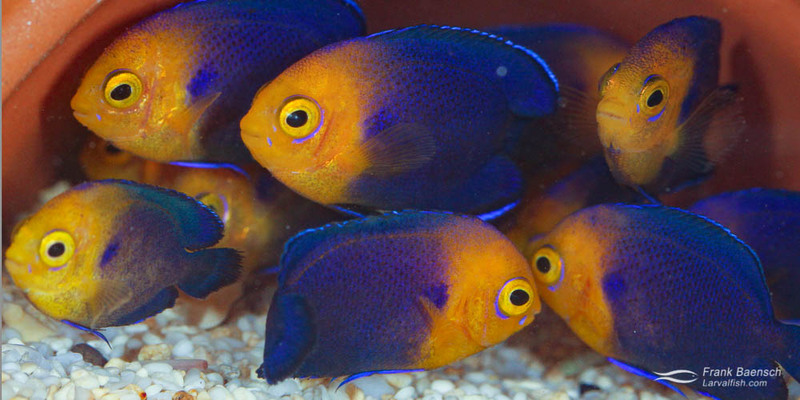 Collected individuals are suitable for reef aquariums but may become aggressive once established. Cherubfish larvae are strong and fast growing. They begin settlement near 40 days post-hatch (dph) and complete their transition to juveniles between 50 and 60 dph. I consider this one of the easier Centropyge species to culture; however, present economics (low price of collected individuals) makes production in the near future unlikely.